Katie Bardwell is a senior, and this is her first year on The Red Ledger staff. She is excited to finally test out the waters of journalism. Katie has always had a passion for writing and all forms of art, and one can often find her in the art rooms or the choir room. Katie taught herself how to play the guitar and plays the piano by ear. She loves music, no matter the genre (except for yodelling). If there is a concert in the area, she’s probably there singing (or screaming) along to the artist on stage. She also enjoys “finding a deeper meaning” in everything in the world. Maybe it’s because she has watched “Good Will Hunting” one too many times. Katie plans on majoring in architecture and interior design. Her choice in majors may or may not have to do with her HGTV network obsession. 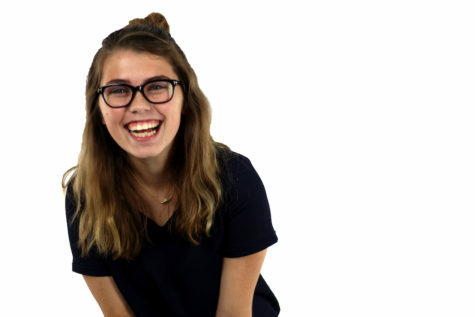 Katie is passionate about writing for The Red Ledger this year, and she loves getting along with her fellow staffers.